YouTube is massive. It’s so big that you could scarcely believe just how gigantic it really is. Most of us consider YouTube to just be a website where we can find music, videos, funny videos, instructional videos, and more. It’s also a great place to find entertainment videos and video blogs. There’s a lot more to YouTube than just this though, as our facts about YouTube and best YouTube tips will show. YouTube has a massive and multicultural society! YouTube has over a billion users, which is over a third of the entire online population. YouTube is available in 76 different languages, covering 95% of the online population. People will watch an average of 40 minutes of video when they open their YouTube mobile app. Ever wondered what the top YouTube searches are? They are “Minecraft”, “Drake”, “Frozen”, “PewDiePie”, “Beyonce”, and “Eminem”, with Minecraft reaching 75%. When the Gangnam Style music video blew up in popularity it actually broke the view counter on YouTube. YouTube had to upgrade the counter. What’s the new limit? A massive 9,223,372,036,854,775,808. YouTube upset an Ohio-based company Universal Tube and Rollform Equipment when they registered their YouTube.com domain name in 2005. The utube.com website of Universal Tube was hit by a number of confused users. They would attempt to sue YouTube for the name before settling on changing their name to utubeonline.com. The first video on YouTube was uploaded by one of the co-founders, Jawed Karim. The video was him watching elephants at the zoo and was uploaded as a test of the service to make sure it was all working. Watch it for yourself by searching for “Me at the Zoo”. Remember the Harlem Shake? Well, among the list of cool YouTube tricks is searching for “Do the Harlem Shake”. If you do that, the page itself will do the Harlem Shake for you. There are lots of tutorials on YouTube, but the most popular search for tutorials is “How to Kiss”. One of the most asked questions when it comes to YouTube is how can you download videos from YouTube. Download the Airy app on to your computer and open it. Copy and paste a link from a YouTube video, channel, or playlist into the Airy app. You can download several videos at once by pasting the link to several videos in the box. Choose your preferred video format for the download. One of the coolest features of Airy is being able to extract the sound from a video without having to download the video itself. Do this by choosing MP3 from the list of formats. Now that we’ve looked at some of the best YouTube tips, let’s take a look at some YouTube hacks and tricks. 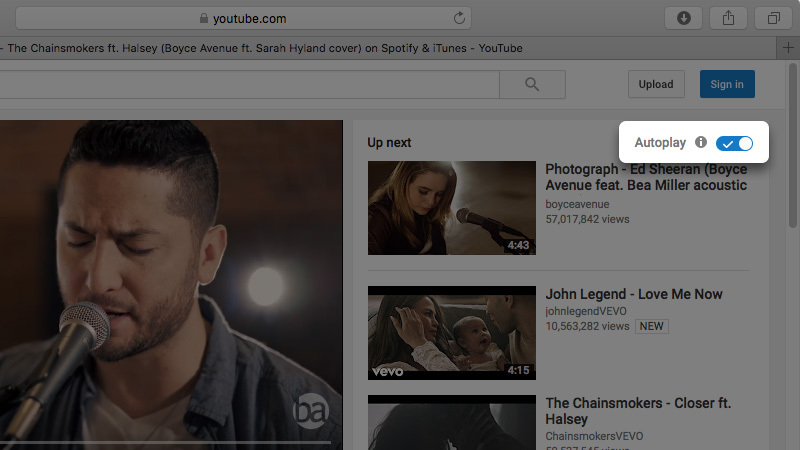 These secret YouTube tricks are a lot of fun so be sure to try them for yourself! You can find the topic page for a musician just by searching #artistname. Add GIF to the beginning of a link on YouTube to be taken to a GIF YouTube page where you can add GIFs, choose the length, and add captions. If you leave Autoplay (the blue slider) on then recommended videos play one after another until you turn it off or leave YouTube. The button for Autoplay is to the top right corner of a page and you can disable it by clicking on it. It should turn grey when disabled. Another beginner YouTube tip is that you can use Google’s own Video Quality Report to find the quality of video you can expect with your internet provider. This service compares your internet speed to other local internet speeds. It gives you information about which ISPs around you are able to handle high-definition streaming. Here are some hotkeys to try! • If you have captions on then press – to make captions smaller or + to make them bigger. If you want to watch a video but don’t have the time for it right now, you can add it to your Watch Later list by clicking “Add to”>”Watch Later”. The YouTube Kids app – which is free on Android and iOS – displays only kid-friendly videos. If you have to wait forever for a video to load, then try adjusting the streaming quality of your account. Open up youtube.com/account_playback and choose the “I have a slow connection. Never play higher-quality video” option. A secret YouTube trick is that you can play videos in slow motion by clicking on the gear icon, choosing speed, and then choosing .5 or .25. These were the best YouTube tips and tricks for beginners and advanced users. We’re sure you’ll have a lot of fun with these tricks, hacks, and tips for the world’s favorite video streaming service.